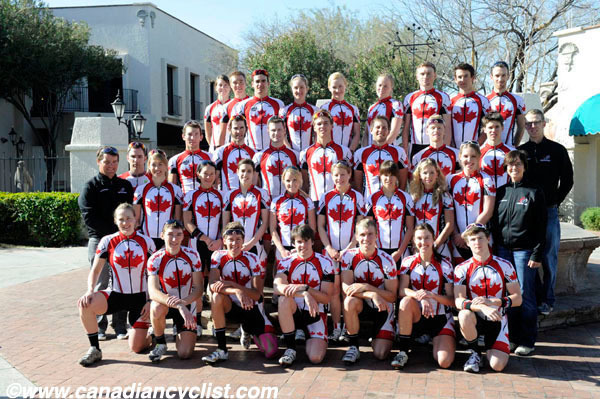 For the first time in at least a decade, the Canadian Cycling Association (CCA) held a pre-season camp for members of the national team. The camp, which finishes Sunday (February 21st) brought together road, mountain and one para athlete in Tucson, Arizona. Over 30 athletes attended, from established stars such as Geoff Kabush and Catharine Pendrel to young riders still looking towards their first world championships. National Road (Vincent Jourdain) and Mountain Bike (Dan Proulx) coaches oversaw the camp, assisted by OCA provincial coach Denise Kelly and mechanic Scott Kelly (no relation). Athletes participated in group training sessions, as well as team building sessions and one-on-one meetings with coaches to plan their programs for the upcoming season. The riding culminated with the locally famous 25 mile (40 kilometre) climb up Mt Lemmon on Thursday (February 18th), topping out at 8000 feet (2440 metres). All athletes - both road and mountain prticipated in the Mt Lemmon ride. The concensus from all participants was that the camp was a huge success. "It was a great opportunity to get everyone together," said Geoff Kabush. "I remember being at the previous ones in Victoria early in my career, and it was a great motivator to be able to ride with some of the top riders. Now, I have the chance to pass on some of my experience to the newer riders." "I hope that we will be able to continue with these sort of events in the future," commented Dan Proulx. "It provided an excellent opportunity to meet with the athletes prior to the start of the season, see where everyone is, and really help build some national team spirit."